Coach Dav Whatmore says removing Bangladesh's Test status is not the way to make them better. After the defeat to England, Michael Atherton and Richie Benaud both said they should not be playing Tests. But Whatmore rejected suggestions they could play in a lower tier, saying: "It's not the answer." 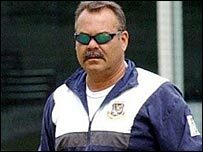 "On the surface it was a one-sided affair but just to say, 'Bangladesh, off you go,' is not right," Whatmore told BBC Radio Five Live. However, the former England captain placed the blame firmly at the door of the International Cricket Council for promoting Bangladesh to the highest level too early. "In time, Bangladesh will surely take their rightful place amongst Test match nations," he added. Whatmore echoed his sentiments, saying: "The potential that lies in Bangladesh is incredible. "This was our first tour of England and to play at Lord's was a wonderful honour and a great experience. "The memory's not too great with the result." Writing in the News of the World, Benaud said the ICC "must remove Bangladesh and Zimbabwe from full-time international cricket until their ability and infrastructure warrant their re-inclusion". He added: "What should be done is to have both countries scheduled to play a carefully programmed series of matches against A-teams and minor teams from the other eight [Test] countries. "They can undertake short tours where none of the opposition will be of international standard and we can see if they are improving, standing still or going backwards." However, the ICC has repeatedly said the duo's Test status is not up for discussion.